Vegan, Veg Caps. Horseradish and garlic extracts with buffered vitamin C and zinc. Vitamin C plays an essential role in numerous areas of human health. Vitamin C contributes to normal collagen formation for the normal function of bones, cartilage, skin, gums and teeth. Vitamin C also enhances iron absorption and the normal energy-yielding metabolism. Vitamin C aids in the maintenance of the immune system including during and after intense physical exercise. Vitamin C contributes to normal psychological function, the functioning of the nervous system and contributes to the protection of cells from oxidative stress. This 'oxidative stress' appears to be a major factor in many human diseases.Zinc is a mineral essential to many body processes including the maintenance of normal cognitive function, vision, fertility and reproduction, hair, skin and nails and the immune system. 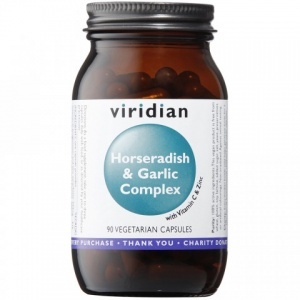 The garlic extract in this supplement is standardised to 4.5% alliin. Vitamin C ( as magnesium & zinc ascorbate) 333.3mg,_Horseradish (Amoraciarustican) extract 200mg,_(Equivalent to 1000 mg dry root),_Zinc (as ascorbate) 10mg,_Garlic extract (Allium sativum) (4.5% Alliin) 50mg,_(Equivalent to 6000 mg fresh bulb).